After some rather obvious revelations about the true purpose of the mission (Gasp! The military is only interested in the Third Energy as a potential weapon!) and a fairly anticlimactic final tyrannosaurus fight (most of the real damage is done in a FMV cutscene), I find that the game is over. I’m told that I found one of three endings, and granted the option to use a grenade launcher with infinite ammo in my next session. So I look online for more info. In the ending I got, I captured Kirk, but at the cost of Gail’s life. There’s a second ending where Gail lives but Kirk escapes — or possibly gets destroyed with all the dinosaurs on the island, but I don’t think that’s very likely, because not only is he handsome and long-haired, he also has a British accent and a haughty, condescending manner. If anyone is going to survive the destruction of a secret island fortress, it’s him. Anyway, these two endings have a clear correlation to an explicit choice given to the player, the last of several instances where Rick and Gail propose two different plans. I had, for the first time, gone with Gail here, out of a desire for completism, refusing to skedaddle when complete victory was at hand. Gail’s death is self-chosen, a result of his own stubborn insistence on giving the mission priority over personal safety. This is actually presented as noble, in a samurai-like way, even though the mission goal itself isn’t. The third ending is the best of both options: the whole team escapes alive 1Except for Cooper, who I had completely forgotten about when I wrote up the mission roster in a previous post, because he got eaten by the tyrannosaur before the opening cutscene was over. with Kirk in custody. I’ve seen claims that you have to complete both of the other endings to unlock it, but reports are inconsistent about this. Possibly this is because different versions of the game are inconsistent about unlockables. There’s a special game mode called “Operation: Wipeout”, in which you simply try to kill as many dinosaurs as possible within a time limit; apparently in the original Playstation version, you had to unlock this by completing the main game once, but it’s available from the very beginning in the PC and Dreamcast ports. The alternate outfits I described supposedly have to be unlocked as well, but obviously I didn’t have to. 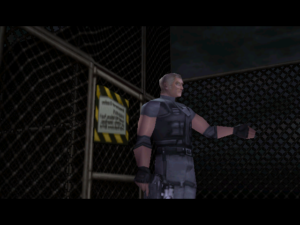 Every mention I’ve seen of the infinite grenade launcher states that you get it after you’ve seen all three endings — typical for videogames of the era, that you only get the ultimate weapon after you have no reason to keep playing — but I got it after only one. The fact that no one on the Web seems to know that the PC version works this way makes me consider the possibility that I am, in fact, the only person to ever actually play the PC version. It’s a B title for sure, guilty of all the little stupidities of its genre, 2One thing about Bissel’s commentary on Resident Evil that I neglected to mention before: he complains about it encouraging the notion that videogames are necessarily stupid, and worse, that they shouldn’t try not to be stupid, that lack of stupidity would somehow spoil the fun. and a console port on top of that. But it’s enjoyable for what it is. 1. ↑ Except for Cooper, who I had completely forgotten about when I wrote up the mission roster in a previous post, because he got eaten by the tyrannosaur before the opening cutscene was over. 2. ↑ One thing about Bissel’s commentary on Resident Evil that I neglected to mention before: he complains about it encouraging the notion that videogames are necessarily stupid, and worse, that they shouldn’t try not to be stupid, that lack of stupidity would somehow spoil the fun. 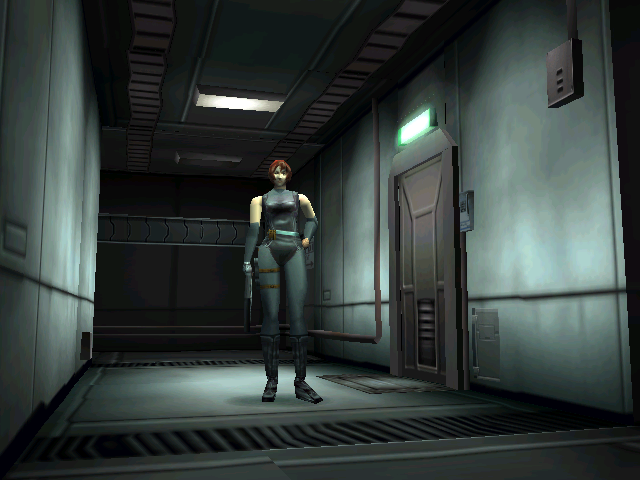 At heart, Dino Crisis is mainly a game about technology. It’s a theme that’s present throughout the game, but it really comes to the fore towards the end, when your main goal is to get Dr. Kirk’s room-filling machines working again. Kirk was researching what he calls “the third energy”. What are the first two energies? No idea. As far as I can tell, “third” is just a way to suggest that things are coming to some kind of dramatic peak, as in Tolkien’s “third age” or Evangelion’s “third impact”. Regardless, the third energy apparently involves harnessing space itself as an enery source. The rifts in time resulting from this, and the dinosaurs that wandered through them, were an unexpected side-effect. And there, we part company from both of the game’s primary inspirations, Resident Evil and Jurassic Park. Like Dino Crisis, both of these works are about man tinkering with nature and suffering unintended consequences, but at least the consequences are directly related to the tinkering. The Umbrella Corporation didn’t actually want a zombie apocalypse, but they did deliberately expose humans to the T-virus with the aim of producing monsters. Hammond didn’t want the dinosaurs to escape and start eating people, but he was aware of the possibility and considered it an acceptable risk when he set up the park. In both cases, their mistake was thinking that they could control their creations. Kirk? He wasn’t trying to control dinosaurs. He had no idea there would be dinosaurs to control. The dinosaurs are almost tangential to the plot. You could swap them out with any other random monster and the story would make just as much sense. Heck, all you have to do is replace “millions of years ago” with “an alternate universe” and you’ve got the premise of Half-Life. 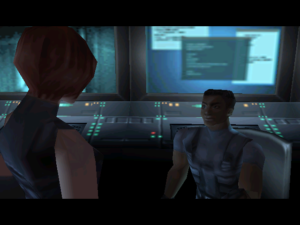 The goals in the game are all about technology: find various disks and keycards that give you access to further reaches of the complex, turn on power systems, access computers, etc. And they’re not so much about defeating technology as about mastering it. There are a lot of Laytonesque self-contained mini-puzzles — I think the most engaging one I’ve seen involves rotating and stacking three pieces of a grille to produce a specific pattern. These are the riddles that the machines pose to you to prove your worthiness to use them. Once you’ve answered them, they will do your bidding. Even those locked doors become your allies against pursuing dinosaurs. The dinosaurs themselves cannot be mastered in this way. They’re only worthy of slaughter. Ammo is more valuable than medicine. That much is clear. Medicine allows you to recover from being hurt. This is well and fine when you’re hurt, but why do you get hurt? Because of dinosaurs that aren’t dead yet. This is the only reason. Nothing but dinosaurs can hurt you. And dinosaurs cannot hurt you when they are dead. Now, I mentioned enhancing tranquilizer darts. This is done through the “mixing” interface, which is also used for enhancing healing items. Mixing things is generally worthwhile. Partly this is because of synergy effects: for example, mixing a med pack with a hemostat (medicine that stops you from losing health from loss of blood) produces two units of an enhanced med pack that heals you and stops bleeding. But also, there are things that simply have no use other than to be mixed. They’re like buffs that affect potions. Now, if you throw enough buffs on a tranquilizer dart, eventually it’ll hit a point where it won’t take any more. The same applies to med packs: eventually it turns into the Resuscitate item, a full heal that’s automatically applied when you die. But both of these unenhanceable things still show up in the Mixing interface. This puzzled me for some time, until I had both of them in my inventory at once — and discovered that they could be mixed with each other. The result? A single poison dart. Ammo is more valuable than medicine, but now I want to find as much medicine as I can. 1. ↑ Yes, I’ve finally encountered therizinosauruses. Just as I thought, they’re basically just bigger, tougher raptors — but also slower, and easier to run past in hallways without taking damage. My last post described the mission leader, a man only referred to as “Gail”. It’s not clear if this is a first name or a last name, so it either fits in the tradition of tough guys with feminine names, like Firefly‘s Jayne Cobb or Vyvyan from The Young Ones, or the tradition of Japanese game designers not knowing what names sound plausible to an English-speaking audience. Anyway, let’s cover the rest of the team. The first one on the site was Tom. He’s not really part of the current mission: he infiltrated the site some time beforehand, posing as a researcher. He’s the one who notified your organization that Dr. Kirk, the scientist you’re there to extract, was present and, more importantly, alive. (“Extract” is such a convenient word here: it leaves it ambiguous whether your mission is to rescue him or to capture him, something I’m still not sure about.) Tom doesn’t spend much time with the team: he’s already badly injured when you meet with him, and dies soon afterward. At least, that’s how it worked in the plot branch I chose to pursue, but I can’t imagine things work out much better for him in the alternate branch, where you decide to ignore Tom’s rescue signal like Gail wants you to. Rick is a bit of an oddity. He’s black, and his voice actor seems to have decided that this is all the characterization he needs. The moment he opened his mouth, I thought I had a handle on the stereotype here, that his role in the story is that of “the black guy”. But no, his role is team technician. He’s the guy you keep going back to for advice (Gail generally seems to be busy), and definitely not the first to die. (That would be Tom, although for a while it looked like it was Gail. Gail’s death seemed plausible, as he’s the least sympathetic character, but he turned out to be tough enough to survive a fall off a cliff in the grip of a velociraptor, which he probably killed with his bare hands.) Well, this is ultimately a Japanese game, and Japan doesn’t have the same stereotypes as we do in the West. Gail’s stereotype transcends national boundaries — if anything, it’s more prevalent in Japan — but “black” mainly just seems to connote “American”. Finally, there’s the player character, Regina. 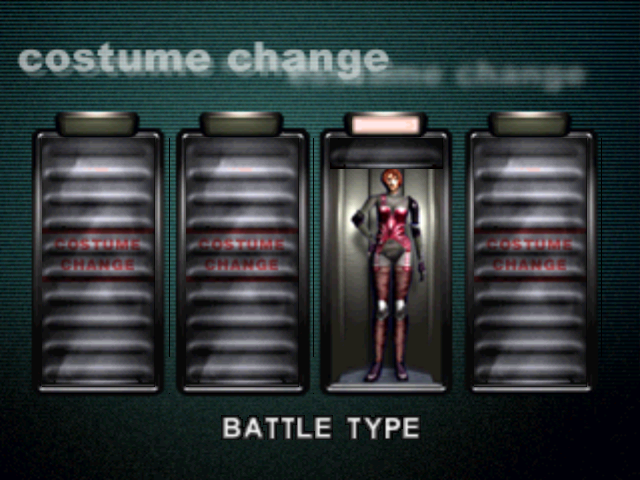 As often the case with player characters, she receives the least characterization. She’s not quite a Gordon-Freeman-like silent protagonist, but pretty much all you know about her is what she looks like. She’s a post-Tomb Raider babe hero with a red dye job. This is something of a break from the patterns of Resident Evil, which (for the first couple of games, at least) provides a choice of male or female player character. It always seemed to me that the original RE seemed to expect the kids playing it — and yes, it definitely expected to be played by kids — to pick the character of their own gender. Regina, on the other hand, is definitely a female character designed to appeal to male players. Everyone on the mission is dressed in a black stealth suit with high-tech body armor, but on Regina, it looks more like a leather corset. That’s if you choose the default outfit. You get a choice of four outfits at the beginning of each session. (You don’t even have to unlock them.) In addition to the “stealth type”, there’s “army type” (olive green t-shirt and extremely short cutoffs), “battle type” (some kind of weird lingerie), and “ancient type” (what can only be described as a Flintstones-pattern minidress). The only other non-dinosaur character I’ve seen so far is a picture of the mysterious Dr. Kirk. He’s handsome and has longish hair, and therefore can be confidently expected to be completely evil. I seem to be finally getting into the swing of this game. It keeps opening new parts of the complex by introducing new mechanics, like using a portable fingerprint scanner on eviscerated corpses to reconfigure biometric ID cards. But regardless of how much of my time I spend on such things, the central concern is which hallways contain dinosaurs, which dinosaur-containing hallways I can avoid, and whether I have enough ammo to kill the dinosaurs in the hallways that I anticipate needing to pass through multiple times. I spent a long time hunting for an ammo cache that I had seen once and forgotten where it was, only to find that it was less necessary than I believed, because the raptors I wanted to kill turned out to be avoidable. Even when you’re in the same hallway as a raptor, there’s the possibility that you can reach the door you want before it gets you; even if you can’t, there’s the option of running for it anyway, getting mauled a little, and applying a medipack on reaching safety. The only real concern is getting repeatedly attacked by the same creatures and wasting more resources than necessary on it — whether healing items for yourself or sedatives for the creature. One thing I didn’t grasp at first is that the raptors actually do move between rooms occasionally, so if there’s a corridor you want to keep clear, you pretty much have to clear the adjacent rooms as well. Ultimately, it may be worthwhile to kill everything you can. And that’s kind of a shame, because a living dinosaur specimen would be an invaluable find. A single compsognathus in a pet carrier could probably fund the entire operation. But that would involve rethinking the mission parameters in light of the new intelligence, that there are dinosaurs running around. This might seem like the sort of thing that you’d want to radio back to base about, if only so the next team would know what to prepare for in the event of a TPK, but it doesn’t even seem to occur to anybody here. I suppose we can blame the team leader. He’s the silver-haired-but-muscular sort of fictional soldier, like the end boss in the movie Avatar, and shares the usual traits of that type, like hardness of both head and heart. In short, exactly the sort to push ahead with the mission regardless of circumstances, even when his crew starts dying. I won’t be at all surprised if he turns out to be in league with the dinosaurs. Let’s talk about the dinosaurs a bit. They are, after all, the alleged focus of the game. I’ve encountered three types so far (one of which isn’t technically a dinosaur), and Wikipedia tells me there are only two others to be seen. Anyway, velociraptors are the basic grunts in this game. You find them wandering in corridors or sleeping in rooms, sometimes in groups. Other creatures can also be identified in terms of their standard videogame roles. Pteranodons are the obligatory flying unit, capable of lifting you off the ground and dropping you like an eagle trying to crack a tortoise. There’s at least one tyrannosaurus, which seems to fill the role of recurring boss. I’ve only encountered it once so far, when it interrupted a cutscene by smashing its massive head through a second-floor plate glass window, and at the end of that encounter, it was clear that I had driven it off rather than killed it. The two types I have yet to encounter — compsognathus and therizinosaurus, apparently — seem to fill other standard niches. Compsognathus is most familiar as the tiny guys at the beginning of Jurassic Park 2 that seemed more like what the velociraptors were supposed to have been than the velociraptors were. So there’s your small, annoying, and hard-to-hit type. Therizinosaurus — a singularly freaky-looking species, to judge by pictures online — are probably the high-level grunts, the replacement for velociraptors when you’re far enough into the game that they don’t seem threatening any more. I’m expecting this mainly because of the way that Resident Evil replaced its standard zombies with tougher, faster, freakier-looking zombies halfway through. Presumably the sequels introduce more species, filling other familiar roles. One imagines a water level where you’re menaced by a plesiosaur. Triceratops seems like a natural for the part of first-level boss that charges at you and is rendered temporarily vulnerable when it smacks into a wall. Unfortunately, the genre more or less demands that dinosaurs have to be monsters, and that makes it difficult to use the less threatening herbivores. For example, I’ve recently developed a certain fondness for the stegosaurus, having found them enchanting in Evolution. (They were the first really large creature you could develop, taking up immense quantities of space to just drift about lazily, grazing.) But it’s hard to imagine a convincing stegosaurus assault, because the only weapon they have is the thagomizer, which is on the wrong end to be used offensively. I’ve mentioned that this game contains both dinosaurs and guns, so it probably doesn’t come as a shock that it involves shooting at dinosaurs. However, that’s not what you spend most of your time doing. There’s a lot of time spent wandering around wondering when the next dinosaur is going to show up, for one thing. Even when you find one, there’s a good chance that you’ll be out of ammo and unable to shoot at it — insufficient ammo being one of the defining traits of the Survival Horror genre. Normally, this would be the point at which you start running from the monsters, which is a good tactic against zombies, but less so against velociraptors. Here, escape means getting a closed door between you and the animal, usually by backing out the way you came. Actually, there’s one other interesting twist on the shoot/escape duality here: tranquilizer darts. These can disable a dinosaur, but they wear off after a while. If you think you’re not going to be coming back to a location, they’re as good as shooting a dinosaur dead, and even if not, they can be used as a stopgap until you find more bullets. Figuring out when it is and isn’t worth using tranquilizers to save your ammo is probably a big part of the game’s tactics, but it’s a complication I haven’t really engaged yet. Speaking of complications, the game has a bunch of gratuitous ones. For example, there are security doors that don’t just require a key, they require a matching data card and a data disk that, once inserted, require you to solve a simple puzzle before proceeding. (How the velociraptors got to the parts of the complex behind these doors when they can’t even operate simple doorknobs, I don’t know. But then, I don’t know yet why they’re present on the island at all, so I’ll let it slide for now.) Or consider the boxes. This is a strange mechanic basically inherited from Resident Evil. In RE, your carrying capacity is limited, and you can’t just drop stuff anywhere, but there are boxes you can stash things in. The strangest part is that they’re all the same box. If you stash stuff in one, you can retrieve it from any of the others. It seemed like a gratuitous complication there, just extra mechanics for the sake of extra mechanics. 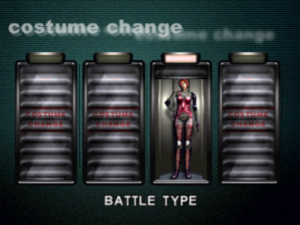 Dino Crisis adds more complexity: you need to open the boxes with “plugs” of various colors, and only boxes with the same color of plug share their contents. Or something like that. Resident Evil had a simple crafting system for making healing items of various strengths out of herbs; Dino Crisis has a more complicated system that apparently can be used to make tranquilizers as well. And that’s where a lot of the time goes, as well as a lot of the player’s attention. On all these little complications. We have here a largish system of details, only some of which are related to the game’s theme or premise. It seems designed for people who have already played Resident Evil backward and forward, and have gotten bored with it. It gives those players new stuff to learn, to persuade them that it’s not just a reskinning of old gameplay.